Living up to that billing has so far produced mixed results. Only about 6 percent of those who work in Playa Vista – some 300 people – also live there, according to new data from Playa Vista Compass, a transportation research and consulting firm. The master-planned community includes residences, restaurants, retail, parks, and office space, all within walking distance of each other. While there are a number of people in the area who do one of the things in the neighborhood’s tag line, there aren’t that many doing all three. The office component of Playa Vista has seen a big uptick in workers over the last two years. The campus comprises 120 acres of creative office space that’s home to a growing number of tech, media, and advertising companies, including Yahoo Inc. and YouTube, with the video website’s parent, Google, planning to move in soon. About 5,100 people were employed at the campus last year, up from roughly 2,000 in 2015 – a spike of about 150 percent. Around 11,000 people live in Playa Vista, according to Randy Johnson, executive vice president of Brookfield Residential Properties Inc., the community’s master developer. Those numbers do not include spillover that has seen companies such as Facebook Inc., Sony Corp., and gossip website TMZ take space across the street from the master-planned community. One likely reason for the low live-work numbers is that Playa Vista cemented its status as a Silicon Beach hub long after the first residents began arriving in 2002. 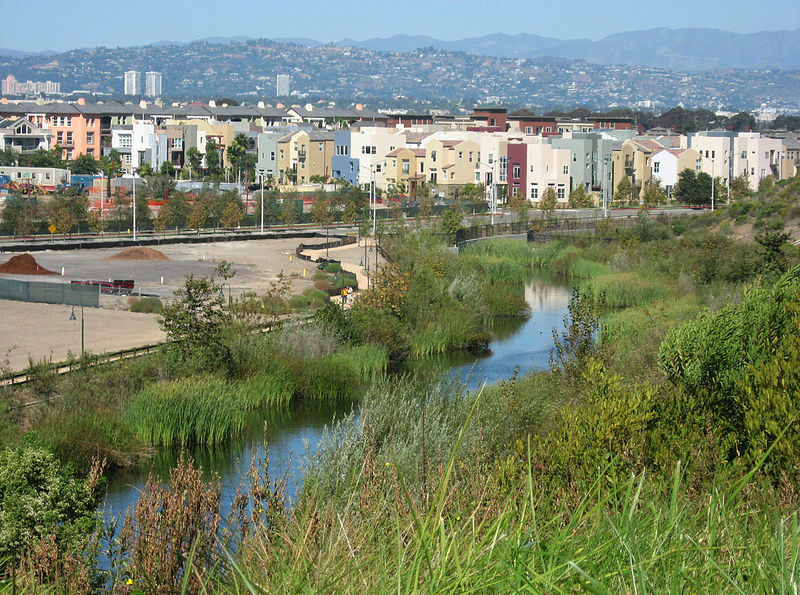 More than half of Playa Vista’s housing stock – roughly 3,200 condos, apartments, and single-family homes – was completed by 2008, before Silicon Beach was even a term. The office campus’ first building was completed that same year, Johnson said, with consumer electronics company Belkin International Inc. becoming one of first tenants on the campus in 2010. An additional 2,800-plus residential units started construction in 2013, and the office campus has seen an explosion of growth since then. Google purchased 12 acres in Playa Vista in 2014 and has leased the 319,000-square-feet Spruce Goose Hangar for further expansion. Johnson estimated that with Google and the newly finished Brickyard office complex, 8,500 more employees will be headed to the campus over the next couple of years. As techies continue to pour in, the housing squeeze is driving up prices, making the neighborhood a costly choice for even well-paid tech industry workers. There are a couple hundred residential units in Playa Vista left to be built, according to Alison Girard, Brookfield’s director of marketing. “Because prices have driven up so much, I feel like if we were looking right now, we would be priced out,” added Linna Hsii, Dennis’ wife, who works as an attorney for Icann, the nonprofit internet regulatory agency, also based in Playa Vista. The Hsiis purchased a three-bedroom condo in 2014 for $1.1 million, and their neighbors have an identical unit on the market now that’s listed at more than $1.5 million, according to MLS. The asking price for homes in Playa Vista has increased by 43 percent since January of last year, according to real estate data provider Redfin. The median list price in the area is $1.3 million with a median price per square foot of $674. Nearby Culver City has a median list price of $1.05 million and a median price per square foot of $614. Playa Vista housing costs still haven’t reached the heights of Venice, however, where the median list price is $1.82 million at a median price per square foot of $955. Prices show no sign of moderating. A new single-family complex called Jewel, at 5900 S. Village Drive, is catering to tech executives moving to Silicon Beach with homes starting around the $3.5 million to $4 million. Apartments are pricey, too. Local real estate agents said the cheapest one-bedroom units they’ve seen in Playa Vista go for $2,500 a month, well above the Los Angeles County median of $1,850. “If home prices go up, it might make it less affordable for someone else, so the only alternative is to go to a rental. Now you’re pushing people to the rental market,” said agent William Durfee of Brentwood’s Gibson International. Such a situation might especially be the case for Silicon Beach-working millennials who haven’t saved up enough to buy a home yet, added Dennis Hsii. Those market forces have driven people east. While only a small fraction of Playa Vista’s workforce lives in the community, 28 percent live within a three-mile radius, according to Compass. Incoming employees can get more bang for their buck in nearby Culver City and Mar Vista, agents said, even though the growth of Silicon Beach has driven up prices in those areas as well. Another factor limiting supply in Playa Vista is that about 17 percent of the housing stock consists of rent-restricted units and “controlled price unit” homes that were sold well -below market rate and can’t be resold at market prices for 15 years. There were 325 controlled-price homes built between 2002 and 2008, which were called for in the master plan. Priority was given to local public service workers such as firefighters, police officers, teachers, and nurses. Many of those individuals are holding on to their properties as an investment, said Soboroff. Some of those residents might cash out when their 15-year term is up in the not-too-distant future. Nabbing a rent-restricted unit in Playa Vista is also difficult. An 83-unit complex for seniors at 12481 W. Fielding Circle completed last year has a three-year waitlist. Another 125 controlled-price condos are set to open soon in a project known as Hayden, with prices running from around $400,000 to $450,000. Johnson said 1,000 people applied in the first hour. “Anything under a million in Playa Vista is gone in a matter of weeks,” said Greg Harris, estate director at Beverly Hills brokerage Compass.